It’s no secret that winter is rough on the skin. It’s no secret that most of us, at some point or another, will suffer from dry patches, itchy patches, or just plain ol’ sad and tired-looking skin. It’s also no secret that there are so many natural options for you to save that skin and make it polished and glowing for springtime! I want to share two products that are really helping me this winter with exfoliating my sad skin. 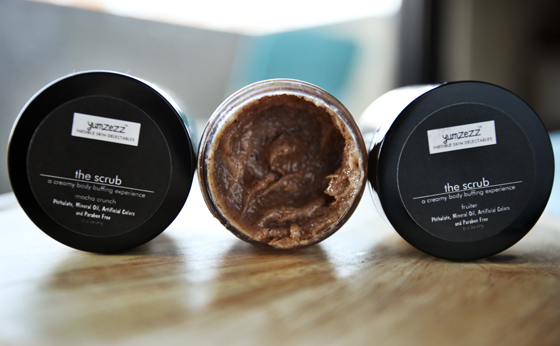 Yumzezz is a line of “inedible skin delectables.” They sent me their creamed body scrubs ($12.50 for 2 oz.) to sample. The basis of their body scrubs is organic sugar mixed with palm kernel oil, safflower oil, apricot oil, shea butter, and other sweets for your skin like honey and buttermilk. A simply divine experience in the shower, you just need a little bit to start working the mixture into your skin to melt your stress away. Their body scrubs come in three different scents: Mocha Crunch (my HANDS DOWN favorite – I’m a coffee addict), Coconut Lemongrass (like your favorite sweet Thai dish) and Fruiter (made with actual milled and sterilized fruit seeds). Just like in life, if I am given the option for fruit sorbet or a deep, decadent scoop of chocolate ice cream…uh, yeah, IMGONNACHOOSETHATICECREAM. Mocha Crunch for the win! Coffee plus body scrubs should always go hand in hand – they wake you up while making your skin luminous. The inclusion of “fragrance” in this product, which no doubt contributes to the delectable smell of this product, set off the alarm bells for us, though. Yumzezz confirmed with us that their fragrance formulation is free of parabens, phthalates and vanillin, which is comforting, though we’d rather it only contain all-natural scents. Also, here’s a fun fact: you don’t need wet skin to use the body scrubs. You can use them on dry skin, as well! Although I have never tried that, (I love me some scrub at shower/bath time) it’s a useful piece of knowledge and a testament to the moisture content in this product!